Introducing Esco Frontier Acela the world class laboratory fume hood design platform with patents and compliance to prove it. Precisely tuned aerodynamics, outstanding user safety, total systems and design flexibility, energy-efficiency, aesthetics and ergonomics- all supported by Esco's solutions-based sales and service representatives in more than 100 countries. Unique Hot Zone Baffles capture fumes quickly. The tapered fibreglass exhaust collar reduces airflow turbulence, static pressure loss, noise level and increases face velocity uniformity. Perfect Pitch Profile™. The gentle pitch of the hood profile enhances visibility. Tri-wall construction and chain-and-sprocket sash system for maximum durability. Sash stop limits sash movement beyond 457mm (18"). When raised above this height, sash will automatically and gently fall back to the safe level (Esco’s CreepDown Mechanism). Sash keylock available to keep sash in place at full open position for equipment loading, or at full close position to restrict access into hood. Constant volume / high performance concept eliminates the need for complex VAV systems. 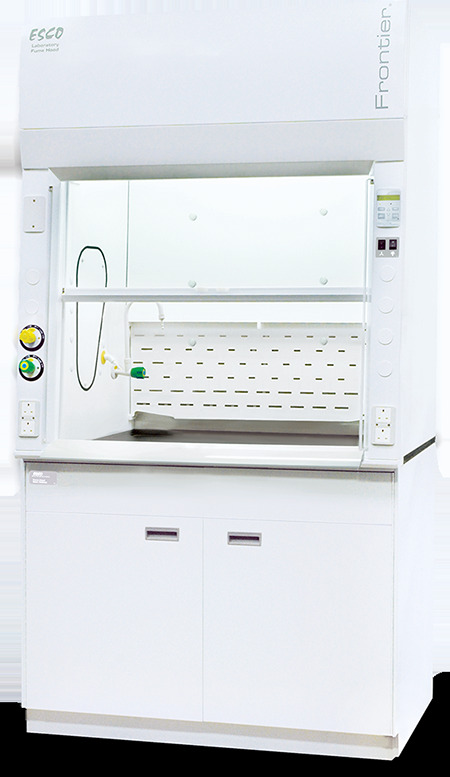 The Frontier Acela Fume Hood delivers outstanding containment (less than 0.05ppm, as manufactured) down to 60fpm face velocity at both 18" restricted and full open sash openings, tested inhouse in accordance to the ASHRAE-110 and EN14175-3 test protocols. Independently certified by Tintschl Engineering, Germany, to comply with the requirements of the EN14175 fume hood test standard. All Frontier Acela Fume Hoods include 1 water and 1 gas Enhanz™ remote-controlled fixture plumbed to the top of the hood and 2 duplex outlets standard (specify outlet code when ordering). External Dimensions* (WxDxH) 1220x900x1521mm 48.0"x35.4"x59.9" 1525x900x1521mm 60.0"x35.4"x59.9" 1830x900x1521mm 72.0"x35.4"x59.9" 2440x900x1521mm 96.0"x35.4"x59.9"
Internal Work Area (WxDxH) 996x672x1240mm 39.2"x26.5"x48.8" 1301x672x1240mm 51.2"x26.5"x48.8" 1606x672x1240mm 63.2"x26.5"x48.8" 2216x672x1240mm 87.2"x26.5"x48.8"
Protects laboratory equipment during sudden fluctuation of current. Only applicable to 230V, AC, 50/60Hz hoods. One set of filler panels required per continous row of hoods.